I can identify the benefits of different modes of interaction that occur within blended teaching (5.1). I can use asynchronous technologies in my classroom practices (5.2). I can create effective online discussions (5.3). I can create a plan for facilitating online discussions (5.3). I can use asynchronous technologies to create effective feedback (5.4). Whether it’s conveying our needs, sharing our thoughts, or collaborating with others, communication is a key component in our lives. Much of what we do when we exchange information with one another is a form of learning. In the traditional classroom, communication takes place in a number of ways. For example, we communicate through class discussion, questions and answers between and among students and teachers, and feedback written on assignments. Figure 5.1 Elementary school students waiting to ask questions. Sometimes teachers don’t see a need to communicate online if students have the opportunity to do so in-person. However, there are advantages and disadvantages to both in-person and online communication. Take a moment to look at the photo of a whole-class discussion above. What do you notice? Perhaps the first thing that you noticed was that several students were raising their hands. Clearly these students are excited to participate! Whatever is being discussed engaged many in the class. That can be a great feeling as a teacher. In-person discussions tend to be fast-paced and dynamic, where you can quickly and easily keep the discussion flowing by asking and answering questions. A closer examination of the students in the above photo can highlight some common limitations of in-class discussions. First, notice at least three of the hand-raisers are using their other arm to prop up the raised arm. It’s likely that they have been raising their hands for some time and have yet to be called on. Time is a major limitation of in-person interaction. Given the bell schedule, time for a robust discussion is limited and not every student gets to participate at the level they’d wish to. Also, it can be common for some students to dominate the conversation, which further limits the available time for others. Obviously, this photo is only a moment in time, and we don’t want to read too much into it, but it highlights some other drawbacks to in-person discussions. Notice that some students seem to have disengaged from the discussion. It could be that some of those students were raising their hands early and gave up after not being called on. Others may be more introverted and not feel comfortable sharing their ideas in front of the whole class. It’s also possible that the discussion was going too fast or too slow to maintain their attention. Furthermore, some students, for example, those who may be English Language Learners, could be unable to process what is being said or formulate comments fast enough to participate. Other students may have special needs that make participating in in-person discussions especially challenging. Some of these challenges might be alleviated by creating smaller groups of students to increase student participation, but doing so makes it difficult to monitor each group’s discussion. If teachers only engage students using in-person discussions, time, timidity, difficulties with the language, and other classroom dynamics may not allow all students the opportunity to fully express their thoughts. In the blended classroom, there are many options for increasing and enhancing communication. Online discussions can be one way to address participation concerns within the in-person setting. The challenge is leveraging the advantages of both in-person and online interaction and figuring out strategies for how to capitalize on the best of both worlds. You can use the link above to obtain some data for yourself! How do you measure up on being ready to use online interactions in your own blended classroom? The term “interaction” means different things to different people. In 1989, Michael Moore defined three different types of learning interactions: (1) student-content, (2) student-instructor, (3) student-student (see Figure 5.2). Moore explained that each type of interaction contributes to a quality learning experience. 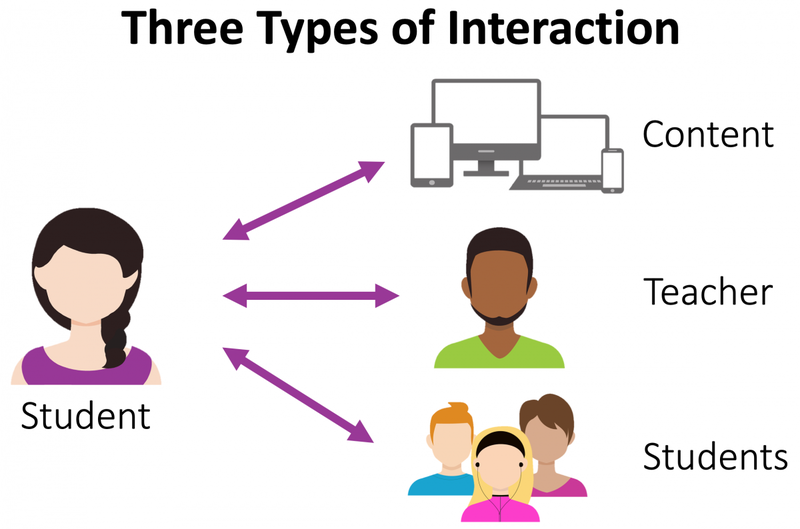 Figure 5.2 Three types of interaction with students. Student-content interaction [https://edtechbooks.org/-DLH] occurs when students engage with learning materials through reading, listening, watching, and/or reflecting. Student-instructor interaction [https://edtechbooks.org/-LP] occurs when students have opportunities to apply what they have learned from their content interactions, demonstrate new knowledge, and receive feedback from the teacher as the “expert.” Finally, student-student interaction [https://edtechbooks.org/-ERi] occurs when students can engage with one another and share their understandings, building on what they have learned. One of the major interactions that can happen in an online setting is the use of discussions. The advantage of online discussions is that they are one of the few online activities that can combine all three types of interactions. Students usually read or view materials to prepare for the discussion (student-content interaction), then share their thoughts with their peers (student-student interaction) in a forum that is moderated by the instructor (student-instructor interaction). As a result, online discussions can be critical in helping students achieve course outcomes because they provide students with a variety of interactions. However, online student-instructor and student-student interactions have different place, time, and fidelity dimensions than in-person interactions. Both place and time can vary in blended courses, from a low degree of flexibility (everyone communicating in the same place and time) to a higher degree (everyone communicating at different times and different locations). As a class you can share the same physical space while having a discussion, but this provides little to no flexibility in where students learn. The same is true for time. 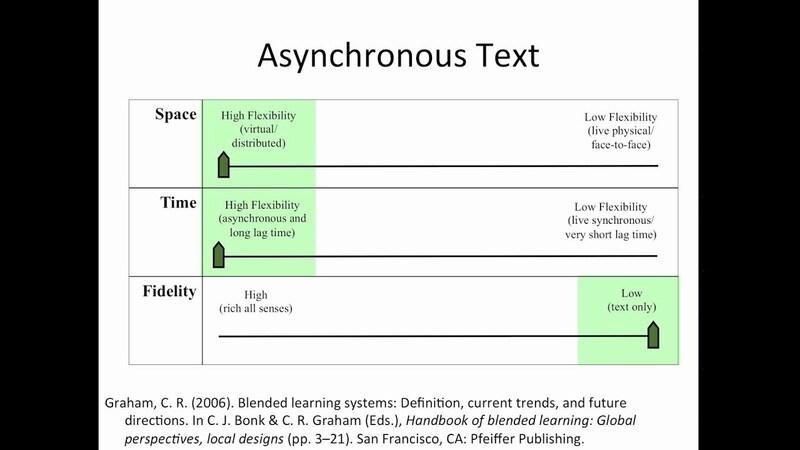 Discussions can be synchronous [https://edtechbooks.org/-mFE], or happen in real-time with low lag time, or asynchronous [https://edtechbooks.org/-iMR], meaning that they occur at different times, and the time between posts or responses may take longer. Fidelity [https://edtechbooks.org/-zKU] refers to how many communication cues are present. It can range from low fidelity, or mostly text-based with no communication cues, to higher fidelity with many communication cues. In-person interactions have the most communication cues, but online video communication can also contain many of the communication cues that we are used to having in-person. Video 5.1 explains more about the dimensions of interaction and discusses the advantages and disadvantages to different types of interaction in various learning environments. What to Look For: Observe how the 4 types of communication discussed vary in terms of time, space, and fidelity. One of the important aspects of blended learning is for the teacher to decide when and how to leverage the advantages of one form of communication over another. While some classroom discussions will be better suited for in-person dialogue, others can allow additional flexibility in time, place, and depth of reflection in an online, asynchronous setting. It is therefore important to understand the strengths and limits of each form of interaction and how each can be used to benefit overall student learning. Most online communication is via text, so let’s compare the strengths and weaknesses of asynchronous, online text-based discussions to those that occur in a traditional in-person classroom. Take some time to read Table 5.1. As you do, consider how some of the weaknesses of online text discussions are the strengths of in-person discussions and how the weaknesses of in-person discussions are the strengths of online text discussions. Synchronous communication is communication that occurs in real-time (e.g., phone conversation, video conference, or in-class discussion). Asynchronous communication is communication that does not happen in real-time (e.g., email thread, online discussion board, most texting is asynchronous unless the back and forth communication is immediate). Flexibility: Students can contribute to the discussion at the time and place that is most convenient to them. Participation: All students can participate because time and place constraints are removed. Depth of reflection: Students have time to more carefully consider and provide evidence for their claims and provide deeper, more thoughtful reflections (Mikulecky, 1998; Benbunan-Fich & Hiltz, 1999). Human connection: It is easier to bond and develop a social presence [https://edtechbooks.org/-DAU] in a face-to-face environment. This makes it easier to develop trust. Spontaneity: The setting allows for the generation of rapid chains of associated ideas and serendipitous discoveries (Mikulecky, 1998). Spontaneity: The setting does not encourage the generation of rapid chains of associated ideas and serendipitous discoveries (Mikulecky, 1998). Procrastination: There may be a tendency toward procrastination (Benbunan-Fich & Hiltz, 1999). Human connection: The medium is considered to be impersonal by many (Benbunan-Fich & Hiltz, 1999), which may cause a lower satisfaction level with the process (Haytko, 2001). Participation: Not all students can participate, especially if there are dominating personalities. Flexibility: Time is limited, so you may not be able to reach the discussion depth that you would like. Plan an increase in one aspect of student control over time, place, pace, and/or path for one of your in-class units/activities. Create a survey, worksheet, or guide (either physically or using something like Google Surveys) for students to create a learner profile that they can easily and frequently access, update, and track. Brainstorm ways that you can increase student control over goals, time, place, pace, and/or path, and choose the dimension where personalization will occur. Online text communication can foster higher levels of critical thinking because it affords students with additional time to reflect before having to engage. Another advantage is that students can also read over their messages and make changes before sharing their thoughts. 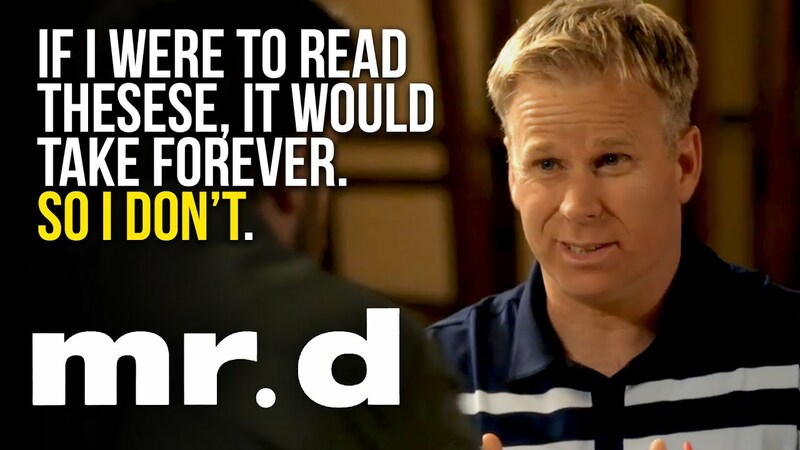 They can also easily refer back to and re-read conversations. Asynchronous video is another online communication option. Similar to text, asynchronous video affords students and instructors time to reflect between exchanges, but video can make the communication feel more authentic and descriptive. The added communication cues in videos can also help the instructor assess students' dispositions and attitudes toward content and allow the teacher to convey encouragement through facial expressions and voice intonations. However, these benefits also come with some drawbacks. For instance, video is not easily edited and can be less convenient to create, view, and re-visit. Asynchronous online tools allow for the greatest flexibility in student contributions, allowing for variation in space and time. A number of online tools can be used to foster online communication and interaction. They are described in Table 5.2. 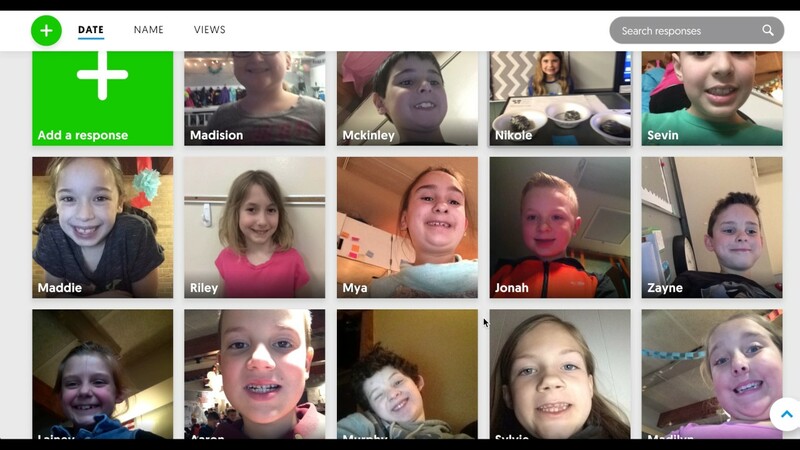 How well does Flipgrid allow the second-grade students in two different classrooms to communicate their understanding through audio and video? Table 5.2 A range of asynchronous communication tools used in education. Discussion boards are the most common and versatile tool for threaded discussions. They are the best tool to use if you want groups of students to participate in extended discussions. Interaction takes place over a period of time. However, it may take longer to manage and provide feedback. Most, if not all, Learning Management Systems (LMS) have a discussion tool built in. However, there are outside discussion platforms available such as Disqus. In addition to asynchronous communication tools allowing students to have flexibility in how and when they communicate, they can also provide students with opportunities to communicate with a wider audience and build global awareness. While students will most commonly communicate with their teacher and classmates, online communication tools can allow them to communicate with others in their community and around the world. The following are a few of the ways that students can interact with a global audience. Microsoft uses Mystery Skype to connect classrooms from around the world. Students then ask the class they connect with yes-or-no questions in order to deduce where the other classroom is located. In Video 5.3, a 5th grade teacher, Scott Bedley at Plaza Vista Elementary School, shares why he uses Mystery Skype and gives us a glimpse into what it looks like in his classroom. What to Look For: How do you think you could use Mystery Skype in your own classroom? WildEarth (https://wildearth.tv/ ) is a live wildlife broadcaster provides students with the opportunity to ride on a live African safari or go underwater with scuba diving marine biologists. Classes can drop in during a live safari or scuba dive, but if they sign up early, they can actually ask safari guides or marine biologists questions and have direct communication with them. Guest speakers can have a powerful impact on students. However, they can be difficult to arrange. Live video communication tools allow you to broaden your search to those who live outside of your area. However, coordinating schedules can still be difficult, especially if you have multiple classes. One solution is for students to interact with others asynchronously using a tool such as VoiceThread. In this example, 4th grade students wrote letters as if they were living in a Japanese internment camp. They then recorded their letters on VoiceThread. Finally, actual Japanese internment camp survivors responded to some of their letters. 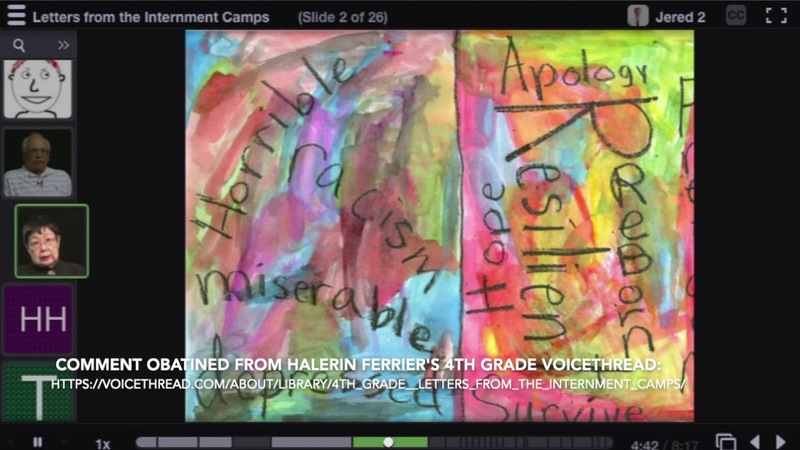 In Video 5.4 below, you can hear one of the internment camp survivor’s comments. What to Look For: How do you think you could use VoiceThread in your own classroom? 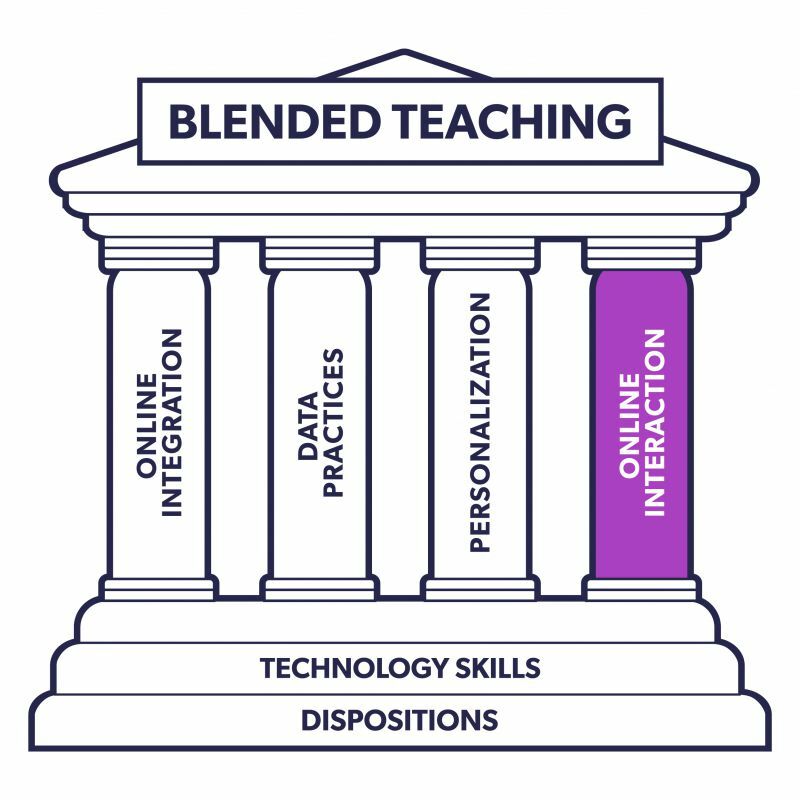 One of the key elements to being able to leverage the advantages of blended learning is the ability to create a positive, supportive, and safe space—not only in the physical classroom, but in the online space as well. Just as students must develop an understanding of the rules, routines, and procedures for communicating and participating in-person, they must also learn the guidelines for online interaction. Figure 5.4 Think System9 is an example of how to make communication expectations explicit. True — Do I have factual evidence to support the claims I’m making? Helpful — Does your post help drive the discussion forward? Inspiring — Does your post add helpful information? Does it inspire others to push their thinking or consider a different perspective? Necessary — Does your post need to be shared? Has it already been said? Kind — Are you posting in a way that is respectful, courteous, and kind to others? In addition, directions for participating in an online discussion will likely need to be quite explicit, especially when beginning. You will want to model the nature of the posts you are expecting. This can include a number of factors such as length, style of writing, any specific formatting conventions you want students to follow, references if required, expectations for number of replies, who will respond to whom, and when initial posts and response posts are due. You can group these aspects into categories of structure, content, flow, and timing. Each aspect of these categories is described in Table 5.3. What to Look For: How can you help your students give and receive better peer feedback in online discussion forums? Table 5.3 Characteristics of online posts. How long should posts be? Can you include a range of the number of words expected? Should the post be a certain number of sentences or paragraphs? How formal do you expect the language to be? While it might be more conversational, the tone should still be academic in nature. Helping students strike this balance is important to model in online discussions. Are there any guidelines you want students to follow when posting, such as a specific title for the subject line? Should students use a greeting and a closing in their responses? Are there sources/references that students need to connect to or cite in their responses? What ideas must students present in their posts? How many posts/replies are required to adequately participate in the discussion? How will students know who to respond to? When are initial posts due? When are response posts due? Do students have enough time to understand the material or discussion before contributing? Competency: I can use asynchronous technologies in my classroom practices (5.2). Choose an asynchronous tool, and plan how you will incorporate it into one of your lessons or learning activities. 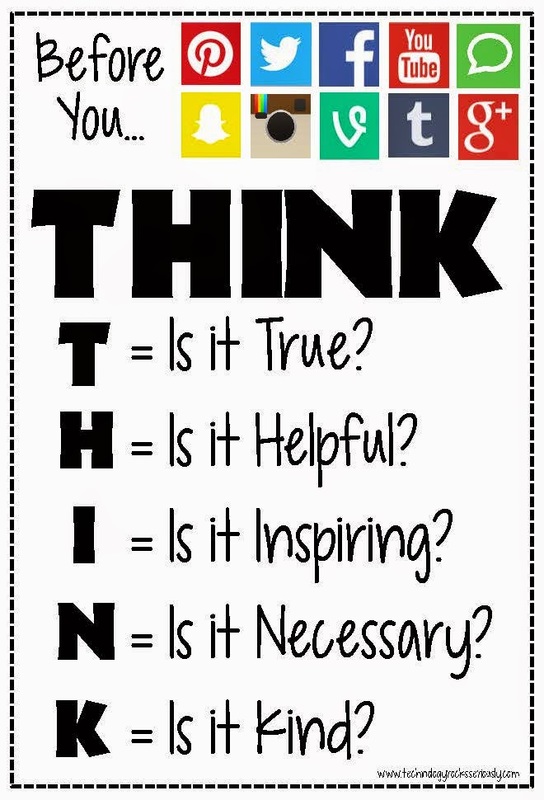 Outline the “netiquette” for your classroom. What are the expectations you have for your students when they communicate online? Are the expectations the same for emails, blogs, discussion boards, etc.? Much as you are an architect of in-class discussions, so too must online discussions be crafted and planned. It takes careful thought and preparation to create an effective online discussion. Once you have established guidelines, you must figure out how online interaction can extend student learning. It’s helpful to keep in mind what you want students to know and take away from the online discussion. You might want to communicate this rationale with students, highlighting what you hope they will gain out of their participation. Once you have determined your objective(s), consider how you are going to make sure that students meet them. It takes planning to formulate an effective online discussion. You may want to think about the source material students will need to read or watch prior to participating, how the online discussion will inform in-person discussions, and whether the discussion will be started, continued, or finished in the online setting to best meet your goals. Discussions can take any number of formats. Some may seek to build consensus among students while others could aim to get students to consider different perspectives. Others could work to have students synthesize information or analyze and defend varying viewpoints. Consider the example prompts presented in Table 5.4 that were provided by University of Oregon Teaching Effectiveness Program. These prompts can help guide you in creating discussion prompts that either build consensus (convergent), consider different views (divergent), or analyze and defend a stance (evaluative). How does gravity differ from electrostatic attraction? How was the invasion of Grenada a modern day example of the Monroe Doctrine in action? Why was Richard III considered an evil king? Suppose that Caesar never returned to Rome from Gaul. Would the Empire have existed? What predictions can you make regarding the voting process in Florida? How might life in the year 2100 differ from today? What do you think are the advantages of solar power over coal-fired electric plants? Is it fair that Title IX requires colleges to fund sports for women as well as men? How do you feel about raising the driving age to 18? Why? Another way to classify discussion prompts is whether they are structured to be teacher-led, student-led, or reflective. Teacher-led prompts pose a specific, direct question while student-led prompts provide students with some control over their topic and format. A reflective discussion might employ the use of “LAW [https://edtechbooks.org/-fRh]”—what you Learned, how it Applies to you, and what are you Wondering. This article offers some helpful tips for bringing online discussions into the traditional in-person classroom. Which of their strategies might be helpful to you? A helpful resource for adding these kinds of asynchronous discussions to your blended classroom comes from Eric Brussel and Elizabeth Aldertonin in an Edutopia article1. They suggest planning ahead and thinking strategically about the prompts you create and use with students. 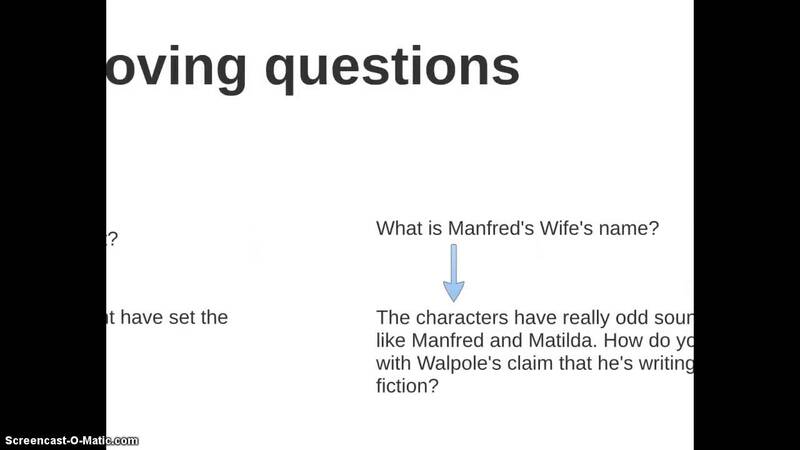 As they note, “Well-crafted (open) questions led to more responses that exhibited higher-level thinking, while closed questions (an obvious right answer) stifled discussion.” This means that if you want a prompt with lots of room for discussion, you should create a divergent prompt [https://edtechbooks.org/-sWf]—a prompt that could have multiple correct responses, instead of a convergent prompt [https://edtechbooks.org/-Sja]—a prompt that really has only one correct response (see Table 5.4). These question types can be mapped to Bloom’s Taxonomy3 [https://edtechbooks.org/-oEe], ranging from those that focus on factual information such as exploratory questions, to others that require more in-depth synthesis and evaluation. Take a look at Video 5.5 which addresses the issue of convergent and divergent discussion questions in addition the use of Bloom's Taxonomy in considering what level of thinking the discussion questions elicit. What to Look For: Make note of the tips that are provided for creating divergent prompts instead of convergent prompts. Open-ended, thought provoking questions encourage students to use higher order critical thinking skills including application, analysis, synthesis, and evaluation. Follow-up replies to students’ posts from both you and fellow classmates can encourage students to push their thinking forward. Take a look at Tables 5.5 - 5.7 that illustrate good and bad examples of the structure, flow/timing, and assessment of discussion prompts. The tables provide a range of examples related to how you might structure a discussion prompt in terms of (1) group size, (2) peer feedback structure, and (3) meaningful roles. In the class (20-30 people) discussion page, describe what you felt upon reading the article from the Washington Times. FEEDBACK: Too big of a group means they won’t read everyone’s ideas. In your reading partner’s (2-3 people) discussion page, describe what you felt upon reading the article from the Washington Times. FEEDBACK: Too small of a group means there won’t be enough responses to have diversity of thought. In your group’s (5-7 people) discussion page, describe what you felt upon reading the article from the Washington Times. FEEDBACK: A perfectly sized group allows for diversity of thought within a manageable number of posts. Table 5.6 Structure – Who gets peer feedback. In your group’s discussion page, describe what you felt upon reading the article from the Washington Times. Then, respond to a peer’s ideas. FEEDBACK: Only one response? Also, they will likely only reply to a friend or popular kid, leaving others out. In your group’s discussion page, describe what you felt upon reading the article from the Washington Times. Then, respond to 2 peer’s ideas to whom you have never responded before. FEEDBACK: Several students still may not receive a response. FEEDBACK: Guiding students to post to specific people, seemingly set at random, should allow all students to receive responses. Table 5.7 Structure – Meaningful roles. In your group’s discussion page, describe what you felt upon reading the article from the Washington Times. Then, respond to the two people who posted before you. FEEDBACK: What are students supposed to respond to their peers about? In your group’s discussion page, describe what you felt upon reading the article from the Washington Times. Then, respond to the two people who posted before you, with at least two things that you like about their post and one thing that you disagree with and why. FEEDBACK: What if they don’t disagree about anything? Does stating what they liked really create a meaningful conversation? In your group’s discussion page, describe what you felt upon reading the article from the Washington Times. Then, respond to the two people who posted before you, playing the role of “devil’s advocate” by arguing counter to their ideas, challenging their viewpoint. For example, if the person stated that they feel that college is helpful in obtaining a job, discuss how trade school can also help people obtain meaningful employment without as much debt. FEEDBACK: A clear role in the response has been created that will stimulate a meaningful dialogue between the students. Table 5.8 provides a range of good and bad examples of establishing the timing between initial post and student peer responses. Table 5.8 Timing/flow – Time between initial post and replies. In your group’s discussion page, describe what you felt upon reading the article from the Washington Times. Then, respond to the two people who posted before you, playing the role of “devil’s advocate” by arguing counter to their ideas, challenging their viewpoint. FEEDBACK: When is this due? When should the students post their responses? Before class, in your group’s discussion page, describe what you felt upon reading the article from the Washington Times. Then, respond to the two people who posted before you, playing the role of “devil’s advocate” by arguing counter to their ideas, challenging their viewpoint. FEEDBACK: There isn’t enough time for students to create meaningful responses after the posts have been created. By Tuesday at midnight, in your small group’s discussion page, describe what you felt upon reading the article from the Washington Times. Then, before noon on Thursday, respond to the two people who posted before you, playing the role of “devil’s advocate” by arguing counter to their ideas, challenging their viewpoint. FEEDBACK: There are now clear guidelines for responses, and enough time has been given for responses to be planned, written, and posted. Table 5.9 provides a range of good and bad examples of clearly establishing expectations for contribution to the discussion. Table 5.9 Assessment – Clarity of expectations. FEEDBACK: What is meant by how they felt? Should they state whether they agree or disagree? Should they write about their feelings and emotions? How long should their initial post and response be? How will they be graded? By Tuesday at midnight, in your small group’s discussion page, in 6-7 sentences, describe the 3 main ideas from the Washington Times article about the importance of college. Include a paragraph of at least 5 sentences outlining your personal opinion on the issue backed up by evidence. Then, before noon on Thursday, respond to the two people who posted before you, playing the role of “devil’s advocate” by arguing counter to their ideas, challenging their viewpoint in at least 6 sentences. FEEDBACK: Students still don’t know how they will be graded. By Tuesday at midnight, in your small group’s discussion page, write 6-7 sentences describing the 3 main ideas from the Washington Times article about the importance of college. Include a paragraph of at least 5 sentences outlining your personal opinion on the issue supported by evidence. Before noon on Thursday, respond to the two people who posted before you, playing the role of “devil’s advocate” by arguing counter to their ideas, challenging their viewpoint using at least 6 sentences. See the rubric below for how points will be assigned. FEEDBACK: Students should now understand the specific evaluative criteria for their posts including: time, length, and content. 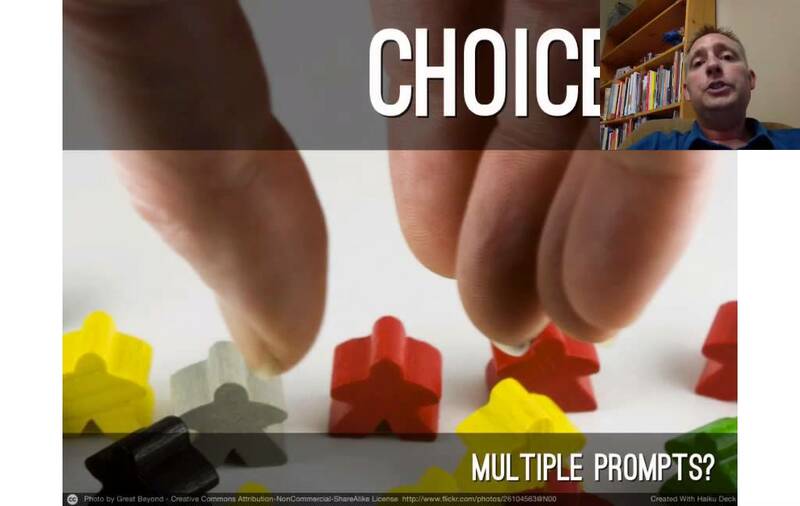 What to Look For: Observe how this video addresses three important criteria for writing discussion prompts: (1) open-ended questions, (2) question focus, and (3) eliciting higher-order thinking. One of the mistakes that teachers who are new to blended learning often make is using their LMS to create whole class discussion activities. It can be okay to have a class discussion board for sharing general ideas about class or asking general question, but these are not ideal for creating student-student interactions. If the discussion group consists of more than 10 members, it becomes very difficult for each member of the group to read all of the posts and know what has been said and what hasn’t been said. Additionally, large discussion groups make it more difficult to create a sense of community; whereas members of a small group have a better chance of getting to know one another. For managing discussions, breaking your class into smaller groups can be helpful. You might consider creating groups with between 4 and 6 members (certainly fewer than 10). If you want all students to get a sense of the discussion happening throughout the class as a whole, groups can have their discussion and then report out to the entire class with a synthesis activity. Another strategy is to assign specific roles within the small discussion group to focus students’ contribution. Over a series of weeks, these roles can be rotated so that each student has an opportunity to fulfill each role. Several possible roles are described below in Table 5.10 (adapted from University of Colorado Denver Online Blog for Faculty11). The Facilitator starts the discussion and keeps it moving. She may pose questions related to the topic at hand or use those provided by the teacher. She makes sure the discussion stays on topic, or publicly recognizes the importance of a “tangent” if one occurs. She also makes sure the group focuses on the most important issues and does not get caught up in extraneous details. The Devil’s Advocate raises possible counter-arguments in a respectful manner. He introduces alternative explanations and solutions based on credible evidence. The Connector looks for connections between the current discussion and past topics, discussions, or overall themes. She may also find and highlight connections between what other classmates have said within the discussion. The Explorer/Innovator works to uncover new potential, encourages imagination, and/or contributes new and alternative perspectives and ideas to explore new areas of inquiry. The Summarizer provides a summary of the discussion for other students to approve or amend at a specified interval. Starting with effective discussion prompts and roles is important, but so is striking a balance in terms of teacher interaction. Too little teacher interaction and students can feel like no one is listening. Too much and you run the risk of dominating the discussion which can limit or hamper students’ interactions, both in terms of quality and quantity. The following suggestions are from Edutopia’s Guide to Mastering Online Discussion Board Facilitation. Structure online discussion board activities carefully and provide clear guidelines for posting material, how often to post, how long the post should be, what information needs to be included (e.g., specific references to content such as readings or videos). Establish clear netiquette guidelines and acceptable behavior policies at the very beginning. Monitor discussion boards regularly and address any issues with students privately if inappropriate posting occurs. Be prepared to remove posts or individual students from discussion boards if necessary. Give students clear expectations about online discussion requirements, deadlines, and grading procedures. Provide structure for students to post to threads. A good structure lessens the frustration of what to write. In your own posts, model ways to support arguments and cite references to support a particular position. Provide a schedule for students of upcoming discussion board deadlines. Give as much notice as possible. Use small group activities to help build community and establish peer communication and connection. You will also want to establish guidelines for giving students credit for discussion board participation, and provide ways to allocate points for posting regularly, responding to classmates’ posts, staying on topic, and responding in a thoughtful manner. Assessing the quality as well as the quantity of the students' online posts is important. Using rubrics will allow students to have clear guidelines of your expectations for the quality of their posts. Providing feedback to students will be discussed in the following sections. Competency: I can create effective online discussions (5.3). Write a discussion prompt that includes divergent thinking and has detailed content, structure, flow, and timing instructions. Divide your class into discussion groups that have 4-6 students in each group. Create a discussion prompt where each student has a specific role to play in the discussion. With your PLC, create an example of a discussion board that models both great discussion board posts (those that follow your guidelines) and not-so-great discussion board posts (those that do not follow your guidelines). As a result, as teachers implement more mastery-, project-, problem-, and inquiry-based learning those same teachers need to reconsider how and when they provide feedback. Assigning grades or scores is not the same as providing feedback. Teachers often provide students with grades or points with generic comments rather than providing them with quality feedback. This leaves students wondering how the teacher decided on their grade and may cause a perception that the teacher is randomly assigning points without truly assessing their work. What to Look For: Clearly teachers don’t actually grade like Mr. D (at least we hope not) but this funny video shows how some students feel teachers grade when they only receive a score and general comments. As you watch, think about how you can make your grading procedures and decisions more transparent to students. So, what constitutes powerful feedback? The simple answer is that feedback is powerful when it is applied by students to improve performance. However, how can teachers help to ensure that happens? Considering the amount of time teachers spend providing feedback, the answer to that question is surprisingly under-researched. Michael Eraut (2006) said it best, “We need more feedback on feedback” (p. 118). In our review of the existing research we found three elements of effective feedback: content, timing, and delivery. Content refers to what you actually say in your feedback. Feedback should highlight the strengths of student work as well as describe ways that it can be improved. General praise and correction are insufficient, and you should provide feedback that is specific to student performance. You should also provide students with the information that they need to narrow the gap between their current and desired performance. In fact, some have changed the term “feedback” to “feedforward” to emphasize that the feedback should focus on improving future performance. Timing refers to when students are provided with feedback. Timing is especially important because students tend to ignore feedback when it is not prompt. Delivery refers to the manner in which you provide feedback, and how it is perceived by students. Although feedback should correct student performance, you should provide it in a respectful manner that motivates students to improve. In fact, research has found that feedback is "an important component for building a strong student-instructor connection" (Boling et al., 2012, p. 121). 5.4.1 Are We Physicians or Coroners? Content: The physician describes what is going wrong and provides a specific plan for fixing it if at all possible, whereas the coroner simply describes what went wrong. Timing: The physician needs to provide a report quickly for it to have a meaningful impact on the patient's health, whereas the coroner’s report is much less urgent and can take months before it is shared. Delivery: The physician needs to have a good bedside manner, share what is going wrong, and prescribe treatment with extreme care. Having a good bedside manner is much less important when a coroner shares a report. Too often teachers act like coroners by conducting autopsies of students’ projects without prescribing timely feedback that allows students to achieve their potential in a way that motivates students to act. 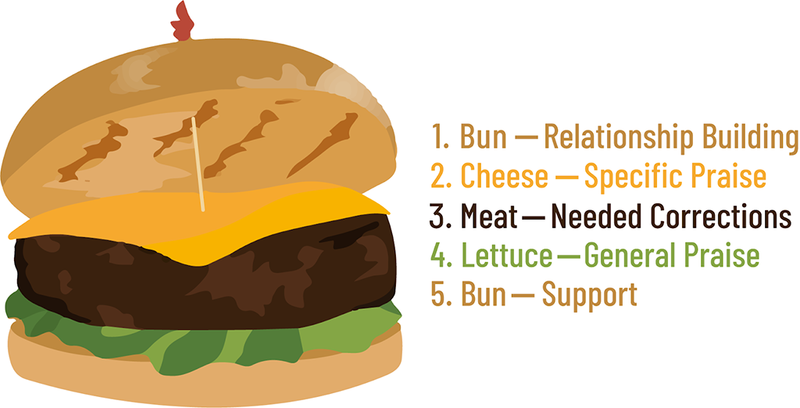 We use the metaphor of a cheeseburger to discuss strategies for providing effective feedback. We chose this metaphor because it can show you how timing, content, and delivery all come together to form effective feedback. There are specific elements that make a cheeseburger, and they are typically organized in a specific way. Feedback is the same way—there are elements that are best organized a specific way. The Bun (Relationship Building): You should remember to greet the student by name. Also, using a little small talk can be helpful to make them feel at ease. These are small actions that can have big impacts on how students interpret and use your feedback. The Cheese (Specific Praise): Next, you should give specific praise that focuses on students’ projects. The Meat (Needed Corrections): Next, you should provide specific corrections. The Lettuce (General Praise): You don't want to end with corrections so it's good to follow them up with some general praise. The Bun (Support): You then want to end with offering support to the student. Remember that no one wants to eat a soggy, or dried out, cold burger. We can't emphasize this enough. Just as you would likely not serve a cold, soggy hamburger, your students are not likely to make full use of feedback that's provided weeks after it was submitted. Online Rubrics: Grading rubrics are a standard feature of learning management system gradebooks. You can easily create detailed rubrics that are linked to specific assignments in ways that not only help you assess students’ work but also help to clearly communicate assignment expectations to students at the start of the project. It is also important to note that rubric scores should not replace feedback comments that are specific to students. Feedback Templates: Feedback should be personal to each student and his or her performance. However, you may often see mistakes or areas for improvement that are the same, or at least similar, across multiple students. In those times, you may be able to save some time by creating a feedback template that can be modified to meet students’ specific projects. Peer Feedback: It’s possible for teachers to spend their time more effectively if students receive feedback from their peers before receiving instructor feedback. For instance, you can implement a three-before-me policy that requires students to receive feedback from three peers before actually submitting the project to the you for feedback. John Hattie’s review of research found that 80% of feedback that students receive actually comes from their peers. Unfortunately, 80% of that feedback is incorrect! As a result, you should help students to learn how to provide quality feedback to their peers. For instance, you can create specific rubrics and then help students understand how to use those rubrics while providing feedback. Chrissy McLaughlin, the 6th grade teacher whose Flipgrid comments we highlighted earlier, uses project-based learning extensively with her students. Commonly students create complex online products. For instance, when reading historical fiction her students create websites using Google Sites to expand on the historical setting of the book. Chrissy provides them with feedback in-person, in text, and via screencast recordings. One advantage of the screencast feedback is that she can be very specific in her comments. The recording also provides students with a permanent resource that they can refer back to when making revisions. 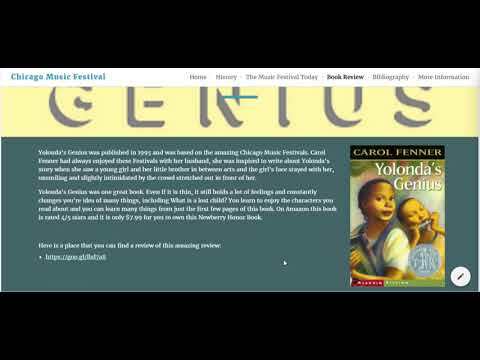 The following video is one of the feedback comments that Chrissy provided to her students. We removed the first portion of the comment because it contained students’ names. We often focus on giving feedback, but how good are you and your students at receiving feedback? Competency: I can use asynchronous technologies to create effective feedback (5.4). Practice using various types of communication to provide effective feedback (e.g. electronic rubrics that you’ve created in an LMS, text-based feedback, and video feedback). Create a space or way for students to provide helpful feedback regarding learning activities or units. For example, it could be a Google Form or a public forum in your LMS. Check your understanding of the concepts in the chapter by taking this chapter quiz. Provide us with feedback on the chapter and help improve future iterations of the book.